At fifteen years old, Emily Cook was a very vibrant young lady who lived life to the fullest. With her charisma, charm and a breathtakingly beautiful smile, she brought happiness to everyone she met. There was nothing Emily wouldn't do for her family and friends. When you met Emily you became her friend for life. She always had a way to make people feel important. 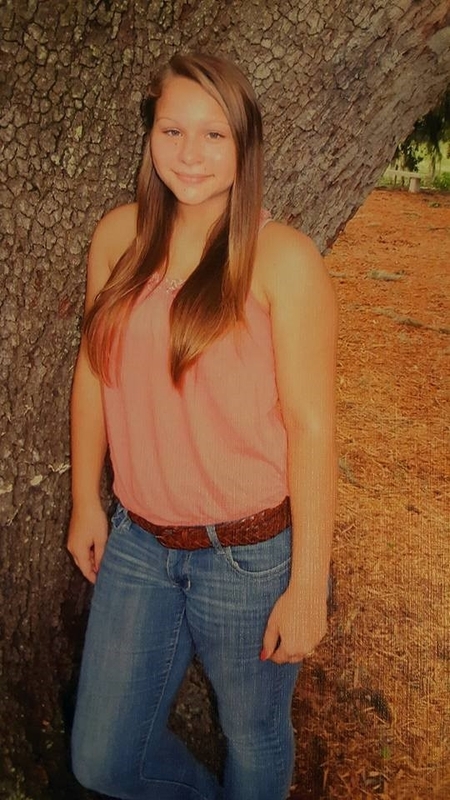 Emily was a freshman year at Gainesville High School and as a weightlifter on the school team, she had amazing sportsmanship and never ending support for her team. On the night of December 13, 2014, Emily got into a car with a friend and her friend’s dad, who, without Emily knowing, had been drinking. Never making it home, her life, along with her friend’s, was taken instantly. The driver was found to have twice the legal alcohol level to be driving. After a year of pleading not guilty, he was convicted of two counts of DUI Manslaughter and sentenced to 20 years in prison, followed by 10 years of probation, with no time for good behavior. Ever since that night life has never been the same for us. The driver imposed a death sentence on Emily…and a life sentence for Emily’s family, friends and all of those that knew and loved her! There isn’t a day that goes by that there isn’t a constant reminder that our family is broken. Day after day we are forced to feel this void that we must live with, a void that was forced upon us, a void that can never be filled. Emily is the youngest of our children, the last child that was living at home. We now know the true meaning that “silence is deafening.” The loss of Emily has been so devastating not only to her parents, grandparents, siblings, aunts, uncles, and cousins--but the biggest heartbreak of all to her nieces and nephews. Those that are still so little they don’t comprehend the meaning of gone, some so young we pray they will always remember those few loving memories they shared, and that they will always know just how much their Aunt Emily loved and adored each and every one of them! An author once wrote this poem…“Life is not always nice to us. People take too many things for granted. Not very many people think if I do this will it affect others. Nowadays everyone just thinks about themselves. It makes me feel and look at life differently. I think of life like a blessing. When you lose a lot in your life including loved ones you think about a lot differently. You process everything before you do them. I just hope that everyone started to figure out what life really is, it is not anything to just say, ‘Oh I will die one day and when it happens it happens’. People have different looks on things than other people. Some people think you only live life once. That is true but you have to live it right,” and that author was Emily Elizabeth Cook, written by her when she was in the eighth grade. Our family would like to thank Mothers Against Drunk Driving (MADD) for all of their great support during this very tragic time in our lives. We ask supporters to please continue to work to eliminate drunk driving to save lives. Our family will continue to support MADD until there are NO MORE VICTIMS!